Codementor Support - How do browser notifications work? All Categories ​>​ Account Basics ​>​ How do browser notifications work? Browser notifications is a notification that pops out from the browser window you are using, regardless of which tab you are on. By enabling the browser notifications on Codementor, you will be able to receive notifications of new chat messages and incoming live sessions. You can turn on browser notifications by editing the settings of the browser you are using. Here are the links to assist you in turning them on: Chrome, Firefox, and Safari. 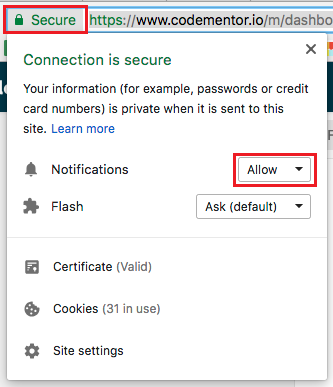 If you are using Chrome, you can also change your browser notification settings by clicking on "Secure" in front of the URL. From there, you can choose to allow browser notifications. Once you've turned on browser notifications, you'll be able to see them at the bottom right (or top right) of your computer screen.